Light curve of the gravitational microlensing event OGLE-2017-BLG-0482. The upper panels shows the zoom of the planetary anomaly region that is enclosed by a box in the bottom panel. The solid and dashed curves superposed on the data are the best-fit planetary model and the point-source point-lens (PSPL) model, respectively. The middle two panels show the residuals from the individual models. Credit: Han et al., 2018. Using microlensing method, an international team of astronomers has detected a new "super-Earth" alien world circling a low-mass star about five times less massive than our sun. The finding is detailed in a paper published March 28 on the arXiv pre-print repository. Based on the gravitational lens effect, the microlensing method is mainly used to detect planetary and stellar-mass objects regardless of the light they emit. Hence, this technique is therefore sensitive to the mass of the objects, especially to low-mass planets like "super-Earths." The so-called "super-Earths" are extrasolar worlds with a mass higher than that of our home planet, but substantially below the masses of the solar system's gas giants. So far, only about 2 percent of known exoplanets were discovered by microlensing. This number should increase as several ground-based observation programs routinely monitor dense stellar fields to search for microlensing events. When a new event is discovered, an alert to the broader scientific community is issued in order to allow follow-up observations. Scientists are interested in events showing evidence for perturbations that could be due to the presence of a planet, or which are predicted to have a high sensitivity to such perturbations. The OGLE-2017-BLG-0482 microlensing event was detected April 8, 2017, by the Optical Gravitational Lensing Experiment (OGLE) using the 1.3m Warsaw telescope at the Las Campanas Observatory in Chile. Subsequent analysis of the event conducted by an international team of astronomers, including scientists from the OGLE Collaboration, the Microlensing Observations in Astrophysics (MOA) group and the Korea Microlensing Telescope Network (KMTNet) Collaboration, led to the discovery of an anomaly, which turned out to be a planetary signal. 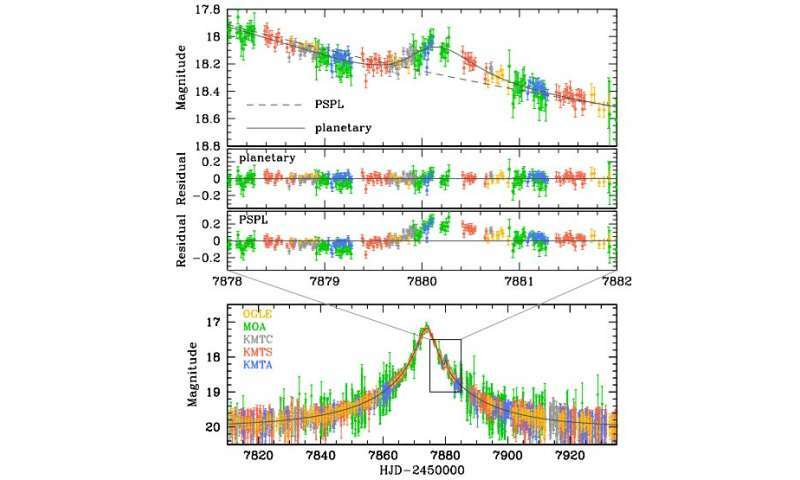 "In this work, we report the microlensing discovery of a super-earth planet orbiting a low-mass M-dwarf host. The planetary system was found from the analysis of the microlensing event OGLE-2017-BLG-0482, in which the planet revealed its presence as a short-term anomaly," the researchers wrote in the paper. According to the study, the newly found planet, designated OGLE-2017-BLG-0482Lb, is about nine times more massive than Earth and orbits its host at a distance of around 1.8 AU. The parent star is a late M-dwarf with a mass of approximately 0.2 solar masses. The newly found planetary system is located some 19,000 light years from the microlensing event. In concluding remarks, the authors of the paper underlined the importance of their discovery, noting how essential is the microlensing technique for detecting new low-mass planet such as OGLE-2017-BLG-0482Lb. "The discovery of the planetary system demonstrates that microlensing provides an important tool to detect such planetary systems that are difficult to be detected by other methods," the researchers concluded. Twice the solar distance equals 1/4 solar radiation with a 1/5 solar mass M-dwarf 1/4x1/5 = 1/20 the solar radation of OGLE-2017-BLG-0482Lbit is much lower than 1/20, more like 1/200 the output of the sun OGLE-2017-BLG-0482Lb is a frigid planet.